Here’s my recipe for the BEST brownies EVER!! This recipe is a favorite for all of us. Very sweet, but were a big hit at an open house. Great for kids and their friends. Since all my friends want my new chocolate chip cookie recipe, I thought it was time to share. I like these better than plain chocolate chip cookies, and the oatmeal is good for you. These cookies are chocolaty, chewy, and delicious. They are a nice change from regular chocolate chip cookies. This spritz cookie recipe was passed down from my mother. The hint of almond flavoring makes them sooo good. "Here's a great snack cake I just made from my Taste of Home cookbook. It's topped with marshmallows, brown sugar, and pecans." During the Christmas season I picked up this delicious, easy new bar recipe. I made these for a baby shower and they were a pleasant surprise. Cream cheese, marshmallow, and caramel filling on a Golden Oreo Cookie based crust. All the flavors of beloved S'Mores in a cereal bar! This is a close re-creation of my mother, Adele's, lemon bread pudding recipe. This is a fancy bread pudding recipe that I make sometimes. 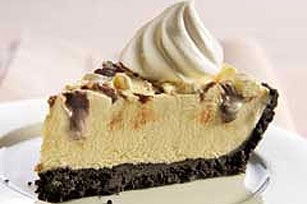 Enjoy the look and taste of a classic sundae in the form of a scrumptious frozen pie. Traditional bread pudding with cinnamon and raisins. I always double this recipe and try to freeze one bag, but they always seem to disappear before they get to the freezer. Very good partly frozen. Not too many calories! I made this cake last night at 8pm and we finished it at supper tonight. My kids are home visiting and it was a big hit. It is so easy. Just tried this rhubarb cake and it is sooo good. The lemon sauce helps and a dollop of whip cream makes it even better. Only takes a cup of rhubarb and is so flavorful. Here is a coveted recipe from my son Joe. He worked in a coffee shop and these scones were baked daily...they were always very popular. Enjoy warm with ice cream and drizzled with chocolate syrup. I make this dessert for St. Patrick’s Day.